I love to take pictures despite feeling somewhat disapointed when I compare the results to professional images or the work of others highlighted on sites such as Flickr, or another great resource, Betterphoto.com. To alleviate this feeling I've completed some research and thought I would share it with anyone else feeling photographic inadequacy or a desire to improve their digital photography skills. A number of the sites were also mentioned in the February 2008 issue of The Connected Newsletter. I've made the mistake of impulsively buying a digital camera based on cost, number of megapixels, and aesthetic considerations which seemed promising in the moment, but later resulted in a camera that failed to do what I wanted. I've learned my lesson and found the sites Buying A Digital Camera and Digital Camera Reviews to be very useful. Each offers side by side comparisons of hundreds of digital cameras with both the novice and advanced photographer in mind. My first inclination with any new piece of technology is to play around with it and see what I can learn on my own. However, I appreciate the guidance and expertise a manual or online resource guide can provide as I try to improve my skill set. The following sites offer a wealth of information concerning photography basics, tips, lighting, et cetera. My first challenge after taking a picture I want to share usually involves editing it for size or adjusting something. The site Picnik offers an easy to use online editor for photos you can upload from your computer reducing the need for purchasing photo editing software. For educators or those thinking of using digital photography in the classroom I suggest the sites Digital Photography in the Regular Classroom and The Digital Camera In Education. Both offer a wealth of information with tons of practical advice. Don't forget the CFL's collection of photography books including collections and how to guides. The photo above was taken by me on February 15th of this year. 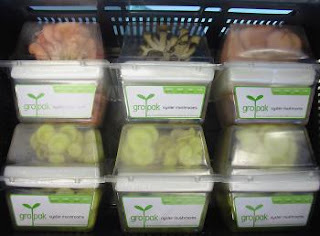 The picture was taken at an abandonded bank on Moreland Ave.
GroPak: The Future of Food? Ok, people, file this under "Green and oh, so cool!" Recent Design Academy Eindhoven graduate Agata Jaworska is responsible for creating packaging for mushrooms that will eliminate the wastefulness of the transit process. When shipping mushrooms from the farm to the store they must be kept cool or they will begin to rot. This is bad for the environment as a lot of energy is used to cool these very warm trucks. But Jaworska's brilliant re-thinking of the supply chain has changed that! She has designed biodegradable packaging that has been treated with a growing medium innoculated with fungi spores. So, instead of wasted time and energy, these packages are loaded onto trucks and the mushrooms actually grow IN TRANSIT. By the time they reach the stores, you have fresh, beautiful mushrooms. You can see an animation of the process on YouTube. 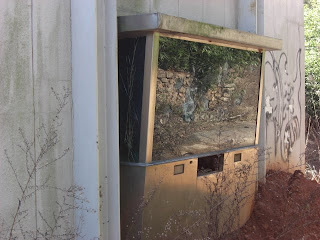 I live in East Atlanta, a culturally and economically diverse area of the city undergoing a number of changes. Until the 1970s the area was predominately Caucasian and middle class. An influx of African-Americans to the area resulted in white flight to the suburbs and a downturn in the economic prosperity of the area as social ills such as unemployment, crime, and lack of development overtook East Atlanta. In the middle 1990s young families, bohemians, and others seeking all the culture and amenities of downtown living began moving to East Atlanta and surrounding areas of Atlanta once forgotten, resulting in the diversity present in the area now. The development and changes in the area have brought about a number of questions and concerns on the part of long time residents and those who question the ramifications of gentrification in Atlanta. Someone addressing some of those concerns while presenting an informative and colorful resource for Atlanta living is atlantalarry, a long time resident of East Atlanta and deeply informed source of knowledge for Atlanta civics and history as a whole. 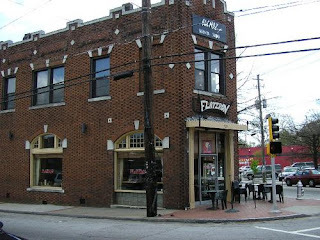 Larry's easy to navigate blog contains information concerning everything from riding Cobb County Transit, to local resources for gardening and history, to a unique collection of photography documenting areas of Atlanta such as East Atlanta, Grant Park, and downtown Atlanta (the image of the Flat Iron above is from Larry's blog). Blogs like atlantalarry are some of the richest resources available for understanding Atlanta as it undergoes some of the most dramatic social and economic transformations ever experienced by the city. For additional resources on Atlanta and issues including gentrification, Grady Hospital, The Beltline, et cetera, I would like to guide readers to Westminster's School for the Common Good Wiki, a resource Vicki Norman and I prepared for the class to create an interactive learning experience. The link will take you to the library's guide with a link to the wiki at the bottom. Since the wiki was introduced students have added a number of resources. Those with additional resources to add are invited to do so. A look through the sports section of the CFL collection uncovered this lost gem, George Schindler's Ventriloquism, a guide many practitioners still hold high regard for despite an original publishing date of 1979. 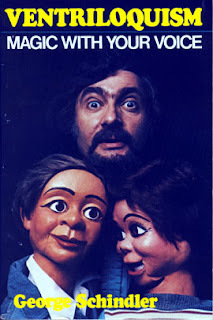 My initial interest in the book originated from the odd depiction of ventriloquist and dummies on the cover, an image surely meant to relate humor, further exploration of the book's content relates a thorough and fascinating understanding of how one can become a ventriloquist for fun and profit (if such a market still exists). The author begins the book with an explanation of what ventriloquism is, making others believe your voice is emanating from somewhere other than yourself, and how one can begin to develop the skill of throwing your voice. A concise but informative history of the art of ventriloquism relates origins in Egypt with the use of puppets beginning in the 1800s in Europe. Our current understanding of ventriloquism was popularized by the Vaudeville circuit in America, children's show star Charlie McCarthy, and various comedy routines with ventriloquists speaking through puppets. The majority of Ventriloquism details sound techniques, exercises, and methods for learning to throw your voice. The detail and coaching given by the author is detailed enough for anyone who may need extra help or varying approaches. The extensive substitute sounds section for working with a closed mouth is especially helpful as is the secrets of the trade section. Another chapter explains what to look for when choosing a puppet, how to work a puppet, and alternatives to traditional dummies. The photos and illustrated steps found throughout the book also lend a level of understanding and context needed for those learning the art of ventriloquism. The last third of the book deals with scripting, booking a show, and writing comedy material for a performance. There are even some scripts ready to perform. I have to wonder if there is an audience for ventriloquist acts in a time when puppetry in film and television is replaced by computer graphics and comedy has changed so much, but the artistry of watching a person speak through a puppet is still something entertaining to me when done well. Every few years kids pick up on an old trend and make it new again (the yo-yo, origami, scooters, et cetera). Perhaps ventriloquism will undergo a revival with small children obtaining their own portable dummies for neighborhood talent shows? One can only hope! I have always found Japanese water-colours to be a fascinating form of art representing a very distinct style and culture. Thankfully for myself and others who enjoy Asian art in general, and Japanses art specificaly, Westminster''s CFL owns a wonderful collection of Asian art books including J. Hiller's wonderful collection of water-colours entitled Japanese Colour Prints, a concise collection suitable for those wishing to forgo the often overwhelming art collections available detailing Japanese art. Many examples of the style are familiar to Americans because of the widespread popularity and disemination of water-colour images in Japan and abroad after the country was opened to interaction with the West. The style gained prominence in 17th and 18th century Japan with its own school of art called ukiyo-e, translated as "pictures of the floating world." The rise of the Japanese color-print contrasted greatly with Western traditions which detailed reality and the telling of a story, whereas ukiyo-e placed emphasis on technique involving lines and brushstrokes. In his introduction Hiller notes, "The Japanese genius was for the expressive line, for pattern and design, the representation of natural objects as a means to an end, not an end in itself." 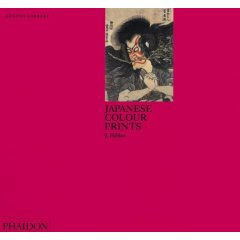 Japanese Colour Prints and other books dealing with Japanese art (see below) are available in the CFL. In addition, the websites listed below should offer wonderful collections of images in the ikiyo-e style and tradition. "Illustrated essays on the artists, designs, and techniques of traditional and modern Japanese woodblock prints." I count myself among those who believe the post-it note rivals only the home computer as the most important invention of the 20th century (actual statistics to back this belief are unavailable and unnecessary to the entry you are about to read). 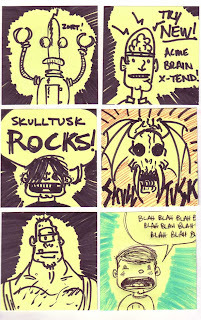 I remember once running out of post-it notes at work and having to wait a few days for more to arrive with a regular office supply order, leading me to nearly go crazy as I stuck pieces of torn paper on my computer/work area with tape trying to recreate the post-it note's utility. The habit of sticking post-it notes everywhere could not be broken. My love for post-it notes brought me to P.I.P. (The Post-It Project), a blog whose creator has transformed the post-it note from functional communition tool, to art canvas. On display are both the blog author's original works, and a host of contributions, including some representing little more than scribbles, and others with quite intricate drawings. This is folk art at its best. This week's choice for Carlyle Fraser library's hidden treasure was influenced by the recent Indian art exhibit at Emory's Carlos Museum. Previously, I knew little about Indian art but appreciated the rich colors and detail present in many of the works I had seen. After the exhibit I wanted a collection of images representative of the works on display at Emory. I found such a resource in our library's copy of India: Art and Culture, 1300-1900, a collection of images from New York's Metropolitan Museum of Art which hosted an extensive exhibition of Indian art in 1986. 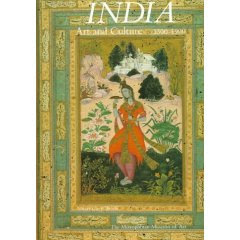 The book features two hundred ninety-six illustrations in vivid detail along with sectional overviews of various periods In India's art history including "The Great Tradition," "Tribe and Village," "The Muslim Courts," "The Rajput World," and "The British Period." The accompanying text also highlights the historical context of the works with rich detail and a comprehensive bibliography. This collection serves as a rich introduction and overview of one of the most beautiful collections of art found in the world. 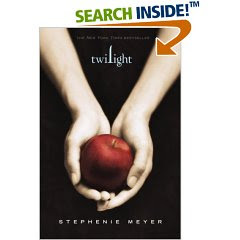 "TWILIGHT tells the story of 17-year-old Bella Swan who moves to the small town of Forks, Washington to live with her father, and becomes drawn to Edward, a pale, mysterious classmate who seems determined to push her away. But neither can deny the attraction that pulls them together... even when Edward confides that he and his family are vampires. 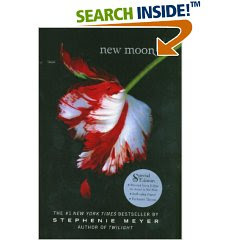 Their unorthodox romance puts her in physical danger when Edward's nemesis comes to town and sets his sights on Bella." The two subsequent novels tell of their deepening relationship and the dangers that continue to surround Bella, a mortal who knows too much about the undead. 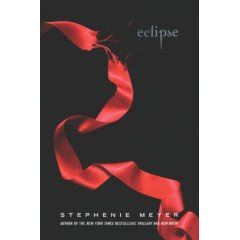 The 4th and final novel, Breaking Dawn, is scheduled for release on August 2, 2008. The Carlyle Fraser Library owns all three of the first three novels in the series and will OF COURSE pre-order Breaking Dawn! In other Twilight-related news, I read that the Twilight movie is in production! Kristen Stewart has been cast as Bella Swan. 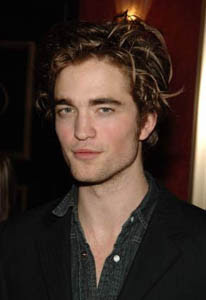 Robert Pattinson has been cast as Edward (If he looks familiar, think Cedric Diggory from "Harry Potter"). De la Cruz has revamped traditional vampire lore in this story featuring a group of attractive, privileged Manhattan teens who attend a prestigious private school. Schuyler Van Alen, 15, the last of the line in a distinguished family, is being raised by her distant and forbidding grandmother. Schuyler, her friend Oliver, and their new friend Dylan are treated like outsiders by the clique of popular, athletic, and beautiful teens made up of Mimi Force, her twin brother, and her best friend. What they have in common is the fact that they are all Blue Bloods, or vampires. They don't realize that they aren't normal until they reach age 15. Then the symptoms manifest themselves and they begin to crave raw meat, have nightmares about events in history, and get prominent blue veins in their arms. Their immortality and way of life are threatened after Blue Blood teens start getting murdered by a splinter group called the Silver Bloods. Zoe is 16 and facing bereavement: her mother is dying of cancer, and her father seems to be excluding her from her mother's hospital bedside. No one dares speak to Zoe about the family tragedy, and she is isolated by grief, anger and fear. Then she meets the alluring, enigmatic Simon ("His eyes were dark, full of wilderness and stars"), who has an uncanny ability to recognize her feelings. After a series of nocturnal meetings, Zoe learns that Simon is a vampire kept alive by his thirst to avenge the death of his own mother three centuries ago. Drawn to him by an empathy charged with both longing and fear, Zoe agrees to participate in a dangerous scheme to trap Simon's mother's supernatural killer. The two emerge from their encounter able to mourn and acknowledge their losses. First-novelist Klause is excessively ambitious in her juggling of genres and themes; as a result, her suspense is uneven, her love story inadequately rooted and her resolution just a bit pat. Nevertheless, the use of the vampire figure to exorcise Zoe's complex feelings and often striking prose attest to an intelligent and original eye. So, I'm innocently surfing the internet for interesting photography, images, art in general, and what do I find, photos of Star Wars origami that amaze me. 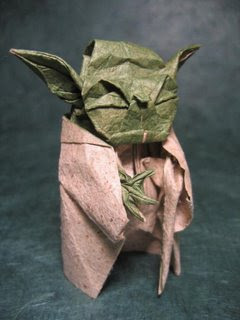 Some of the origami figures are incredible (see Yoda to the left for instance), and others are respectable works which fail to fully dazzle the viewer, but still serve as inspiration for those who seek the power of the force through paper crafts. The Star Wars origami images are collected on the blog Splendid Pictures Around The Net, a site collecting images including the hilarious "Security Guard At Work" which features sleeping security guards on duty, the outlandish "Japanese Extreme Modified Vans," and the unexpectedly inspiring "Fork Art" wherein forks are transformed into works of art. No matter your visual medium of choice, each visitor will find something on interest in the blog. Steampunk the term is a combination of steam denoting the steam powered era of the 19th century, and punk, referring to cyberpunk's speculative interpretation of the future as exampled in literature such as William Gibson's Neuromancer. Speculative fiction writers such as Jules Verne, authors who offered a future beyond the means of their immediate present, are also sources of inspiration. A subset of steampunk has emerged to include the alteration of modern technology to reflect the aesthetics of older technology. 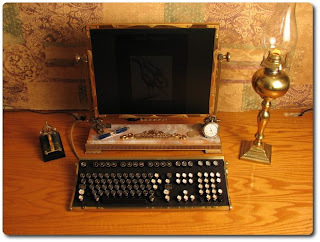 For example, a new laptop is modified to look as though it existed in the Victorian era. The modifications to existing technology are truly amazing, both creatively, and in the dichotomy between new and old existing as one. The following links are fascinating portals to a new understanding of design, innovation, and historical connection. The image above is taken from The Steampunk Workshop site linked below.